Take green gram in a bowl and wash it. Add water and soak it for half an hour or till done. When done remove the water and keep the soaked green gram aside. Slice the cabbage finely with a thin slicer in a food processor or with a sharp knife. Take this cabbage in a microwave safe bowl and add little water. Cook this cabbage in a microwave oven on high power for 5 minutes. Stir with a spoon and microwave again on 30% power for 7 minutes. As we are using very little water, we need to cook in microwave for a longer time in 3 intervals. Stir once again and microwave again on 30% power for 5 minutes. Give standing time 5 minutes before removing it from the oven. After cooking the cabbage spread it in a plate to cool. Wash & clean green chilies & ginger and grind them to a coarse paste. Wash Curry leaves and chop them finely. Take the cooked cabbage and remove excess water by pressing hard between your palms. Collect the water in a bowl and keep it in fridge as this can be used as vegetable stock. Heat a pan and add oil to it. When oil is hot add Cashew Nuts and fry till golden in color. Remove the fried cashew nuts and keep them separately. In the same oil add black gram and fry till it changes color. Then add mustard seeds and cumin seeds and fry till the seeds splutter. Add the chopped curry leaves and coarsely ground chili-ginger paste and fry well. Add chopped onions and fry till they become transparent. Add turmeric powder and mix once. Add the water removed cabbage to the pan and mix. Add salt, mix and cook for few seconds. Now add the soaked green gram and mix well. Add the fried cashew nuts and mix. Transfer the curry to a serving bowl. Serve hot with plain rice and curd chilies. Use very little water while cooking the cabbage. As the cabbage itself holds lot of water, cook in very little water to get less stock in the end. Sprinkle just few drops while cooking. If required we can add few more drops and cook the cabbage. As you have seen in the above movie clip, we have cooked the cabbage in 3 intervals by stirring and adding water when required. Do not throw away the cabbage cooked water. We can make Rasam with this cabbage water or use it in any gravy dish. This stock contains vitamins so use it innovatively. If for any reasons you are throwing this cabbage water, throw it at a far off place as it smells bad. 54 Recipes you may also like to watch. This is Lahari. Today mee site lo choosi cabbage pesarapappu koora chesanu. Chala baga vachindi. Adi tinnappudu okasari India velli vachinattu anipinchindi. Thank you so much. 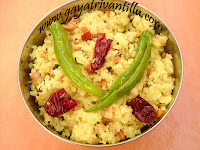 Thanks a lot Gayatri garu, your recipes are very helpful for us. memu monna cabbage kura meeru cheppinatlu try chesamu. chala baga vachhindi kura. thanku for u r receipee. Your website is simply superb. Thank you very much for the great effort behind the scene and helping us lot in US to get through our daily needs. 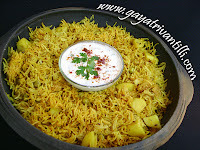 Once again, Gr8 gr8 - Big Thanks..
My name is neeharika.I came across your website through google.Your website is very nice and videos are very good.I like the way you are presenting the recipes...I tried Cabbage pesarapappu koora and it came out very tasty. I really want to appreciate you for sharing such a wonderful recipes.Now dialy i am browsing your site for recipes. Ur videos are really simply superb. I love cooking so much. Iam from visakhapatnam. Now iam in Boston. Ur telugu explanation is really good. U r explaning very clearly for each of ur recipe. Really it is very nice. thank u very much for ur efforts.